I like to think my subconscious plays a larger role in my makeup choices. That’s how I end up with multiples of the same (or similar) shade. We’ve seen this happen before but this time it’s about blushes. For the longest time I’ve been reaching for the same kind of blush color. It’s usually sheer and seamless in neutral peachy or mauve tones. I pretty much have every colour in the blush spectrum except lavender I suppose but, this is the one I reach for the most. You will always find one or two of these on my top shelf. The newest addition is Burberry Skin Light Glow Blush in Earthy, a very muted light brown. By itself it looks very cool toned but on me it draws more warmth and is slightly peachy without looking muddy. It’s heavily fragranced but the formula is a very silky matte. I like my blushes sheer that can be built up as I please and with Earthy I need to do so twice or thrice, which isn’t too bad. I love the colour but it’s not the most long lasting blush. This begins to fade after four hours. Nars Powder Blush Douceur is my first love which is unfortunately, discontinued. I basically dedicated an entire post lamenting about it but all you need to know is that the colour is the perfect warm pink neutral and that if there’s ever a petition to bring it back, you need to act on it. I usually find Nars blushes to be very pigmented but Douceur is an exception as it’s sheerer, but even with the slightest wash, it will last for hours. 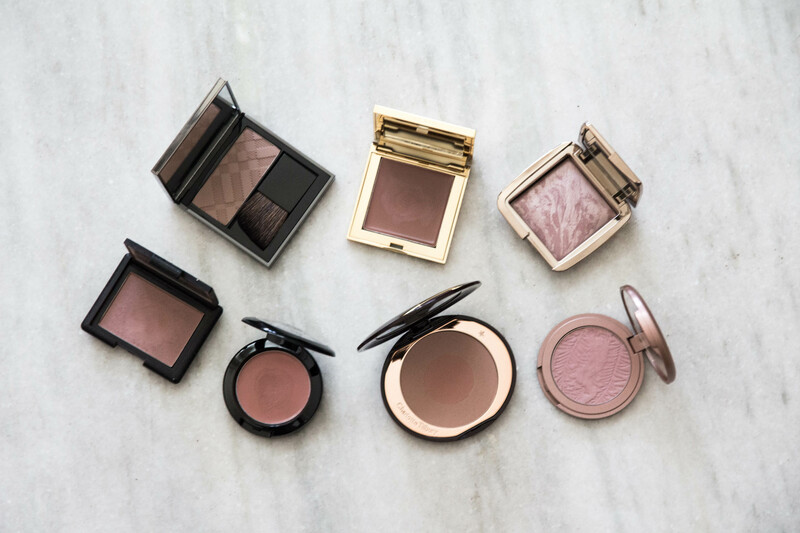 Often touted as a dupe for Douceur, which it is not, Tarte Amazonian Clay 12 hour Blush in Exposed is the one blush from this lot you might already have! It’s beautiful and is a true mauve. The formula is one of the best and I find this to last the longest though not 12 hours, as claimed. The formula, again, is a sheer matte that is very easy to blend. The following two are very similar and new-ish to my collection. I fell for the marble effect here! Hourglass Ambient Lighting Blush in Mood Exposure is a light mauve with light reflecting particles that makes it partly matte and partly luminous. If you have a matte base on, this might be the one to go for. The glow is very subtle and the blush doesn’t look flat like other matte ones. Much like the Ambient Lighting Powders, this is very fine and does kick up a bit more powder but the formula is as good as it gets. A dupe for Mood Exposure is the Charlotte Tilbury Swish & Pop Blusher in First Time. The outer shade is very pale for me and the inner one is warmer. Mixed together you get a perfect inbetween colour that has very fine shimmer dispersed in a mostly matte formula. It’s very soft and easy to blend and I have no complaints about the formula itself. The packaging, however, feels cheap and delicate. I would never travel with this because the blush discs looks like they could fall apart and crumble if I drop it. But you are essentially getting two blushes in one. 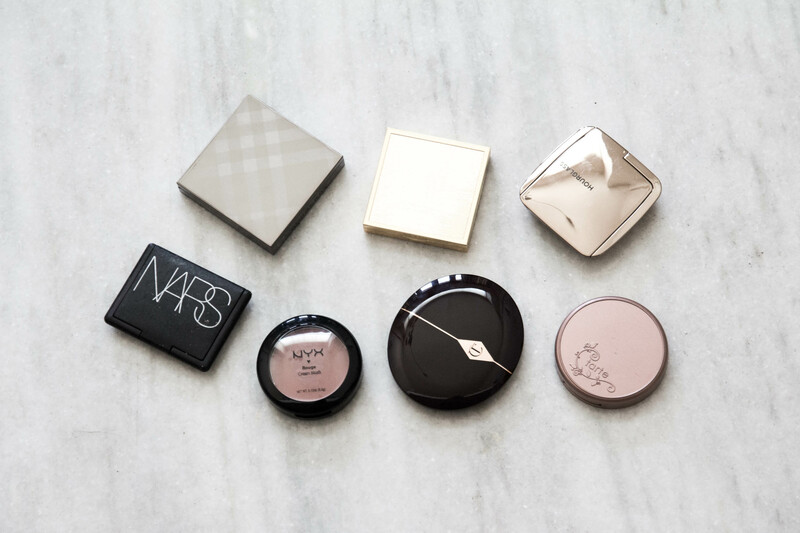 Let’s move on to cream blushes! Aerin Multi-color For Lips and Cheeks in Natural, worn here, is the blush I cannot shut up about! It’s the best discovery I’ve made this year. I’ve always carried it with me when I’ve travelled and raved about it if you ever mentioned ‘blush’. It’s the easiest to blend out of all my blushes and can be built up to many layers without looking patchy. I’ve been loving blushes that have a bit of sheen and enhance the dewy look like this one. It’s not pore friendly in that regard but if that is not an issue for you, you will like this blush a lot. Not the most long lasting blush, especially in this heat, but it serves well for 5-6 hours and then fades into nothingness. The packaging is pretty spectacular as well! Nyx Cream Blush in Tea Rose is just really good value for money. It’s very pigmented and I honestly just lightly swipe my finger when I use this before I tap away. Like Aerin, it has a sheen, blends easily but isn’t the most long lasting formula. But it is that colour which will suit a lot of different makeup looks, it’s a subtle pink. I often rave about the others more and overlook this. I’ve had a for so long now but I definitely need to use it more often. 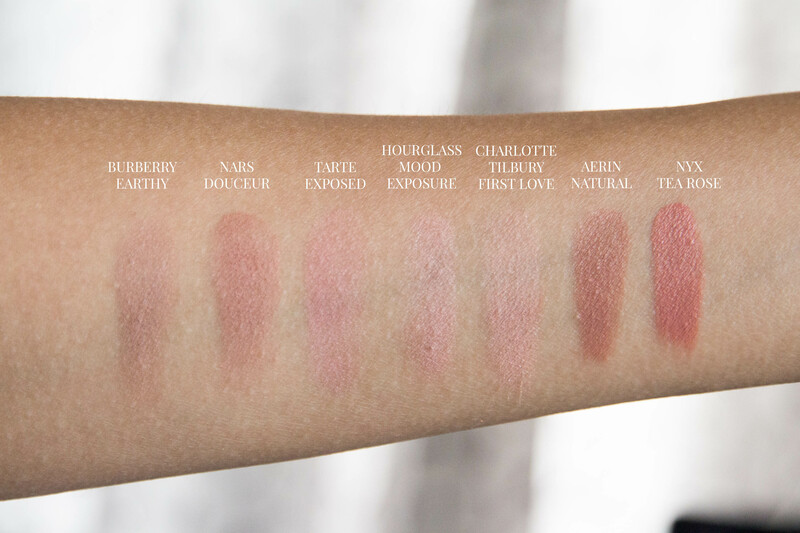 What’s your go-to blush shade? Also let me know if you have any similar ones that I’ve missed out!